Create and publish page variants to test page design modifications and find the best converting design. Each page you build counts as a variant by itself. You can create as many variants of a page as you want to perform split testing (A/B testing) or multivariate testing. By creating a split test and publishing a second page variant, you effectively split all incoming visitor traffic for that page URL between the two page variants. Returning visitors to your page will see the same variant. There are two ways to add a variant to your page: create a new variant or duplicate an existing one. 1. In your page settings view, create a new page variant by clicking "Try testing a different design" under the page settings tab. 2. Enter the name and description of the new page variant. Click 'Create' to create the variant in the editor. 3. Open the newly created variant and make the change based on your test. 4. Publish your page variant to begin split testing. In the example above, there are two page variants. There is a 50% probability visitors are shown the "Version A" variant over "Version B," and vice versa. By adjusting the distribution slider, you change which page is more likely to be shown when visitors go to the page URL. You can start running a multivariate test quickly by duplicating an existing variant. 1. 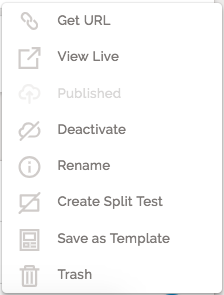 To duplicate a variant, hover over the variant you wish to duplicate and click the "Create split test" icon next to the ellipsis. 2. Click "Create" after you name your new variant. 3. To edit your new variant's page design, click on your new variant name. 4. Open the newly created variant and make the change based on your test. 5. Publish your page variant to begin multivariate testing. 💡Quickly navigate to a published variant by clicking the corresponding color bar in the traffic distribution slider. Get URL - Show the URL for this page. View Live - Opens a new tab and goes to your selected published page in Preview mode. Publish - publish this page variant online (including the most recent changes). Deactivate - Takes your page offline and removes this page from your domain. Rename - Changes the name of the selected page. The page name is used to identify your page and to create a default page slug used to build your page's URL. This does not change the page slug used to make the URL for that page. Create Split Test - Creates a copy of the selected page in the same collection. Save as Template - save this page variant in your current workspace's custom templates. Trash - Trash the page. This will permanently delete the selected page and all the associated data or that page. Get URL - show the URL for this page variant. This URL will always go to this page variant and will not use the traffic distribution feature.